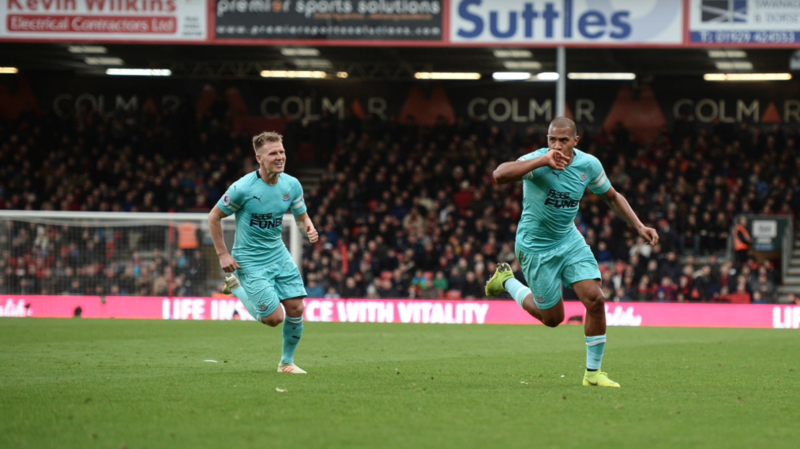 PLAYER RATINGS: Bournemouth 2-2 Newcastle – Three 8’s, a few 7’s, the odd 6 & one 5 – NUFC blog – Newcastle United blog – NUFC Fixtures, News and Forum. A well deserved point in a game we could’ve won on another day, with Rondon and Ritchie scoring impressively and Paul Dummett putting in a big performance at the back. 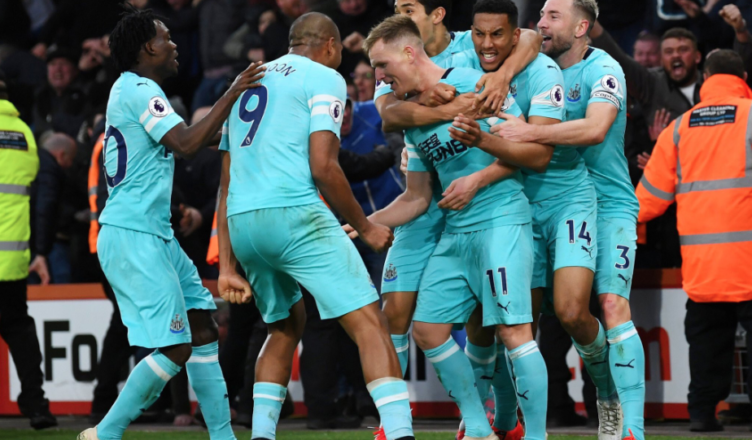 NUFC XI – (3-4-2-1): Dubravka (6) – Lejeune (7), Fernandez (5), Dummett (8) – Yedlin (7), Hayden (7) , Diame (6), Ritchie (8) –– Perez (6), Almiron (7) – Rondon (8) – SUBS – Atsu (7), Muto (5), Shelvey (7). Dubravka – 6 – Claimed several balls into the box comfortably in the first half but had mixed success when Bournemouth threw balls into the box in the second 45. A steady display nonetheless. Lejeune – 7 – Several clearances and an assured display given he was on the right-hand side of a three-man defence today, not his familiar left-sided position. He was very composed and classy on the ball in the latter stages when we were pushing for a goal, carrying the ball well, picking out of some incisive passes and whipping a few great balls into the box. Fernandez – 5 – A few interceptions and clearing headers early on, but he was arguably at fault for both of their goals today. The penalty was harsh – being the sort of interaction that happens 20 or 30 times a game – but he dithered on the ball for King’s second and should’ve done better. Generally solid, but a few costly errors from the usually reliable Argentine in this one. Dummett – 8* – Made some perfectly timed sliding interventions and read the play very well all afternoon, being decisive and cutting out danger brilliantly at times. Saved a certain goal with an outstanding goal line clearance; with this moment epitomising our never say die approach these days. Rock solid throughout from today’s stand-in skipper and my man of the match today – he may not have scored a goal and won’t make the headlines, but his goal saving clearances and solidity at the back was key today. Yedlin – 7 – Did well considering he had both Ryan Fraser and Charlie Daniels to deal with from time to time, defending pretty well and using his pace effectively to break forward on the counter. His regular bursts into the Bournemouth half were then rewarded late on, with his cross being met by Ritchie with the last kick. Diame – 6 – Unspectacular and a little sloppy at times, but effective in his work off the ball. His pressure and physicality unsettled Bournemouth’s midfield, with him making a few strong and well timed tackles too. He’s not always easy on the eye, but he did a solid job in the middle. Hayden – 7 – Linked the play quite well in the absence of a ball player like Ki, Shelvey or Longstaff and did the dirty work well alongside Diame. Had a decent attempts on goal, with one going narrowly wide of Boruc’s front post. Slick on the ball and strong in the tackle. Ritchie – 8 – He was heavily involved down the left from start to finish, with him never lacking energy and endeavour. Although his final ball was frustrating at times, with several crosses and set pieces hitting the first man, he was the one player constantly trying to make something happen – and he never shirked his defensive responsibilities either. His last gasp half volley made up for all of that, however, with him lashing Yedlin’s cross into the roof of the net. Perez – 6 – A quiet game for him after his heroics last weekend. Linked up with Yedlin nicely on occasion and was the link between midfield and attack early on, but he faded out of the game a little and was replaced by Atsu with 20 minutes to go. Almiron – 7 – He struggled to get involved in the final third at times, he played a big part in our first goal, with his 50-yard burst and impressive show of pace drawing a foul in a dangerous area – seeing Rondon fire home from the resultant free-kick. It’s also no coincidence that Ritchie has got much more space since he’s come in, with his movement creating room for him to bomb forward. Not his best game, but his work rate was good, his link up play was decent and his pace on the counter played a key role in Rondon’s goal. Rondon – 8 – Took his goal brilliantly, curling a free-kick past Boruc impressively for a player of his stature. Used his physicality effectively once again, linked up the play intelligently whenever we managed to get decent balls up to him and battled in the blustery winds throughout. That’s now 10 goals for him this season; although he does so much more than just hit the back of the net. Atsu – 7 – Did really well in the final 20 minutes. Got himself into some good areas, looked energetic and a little more direct when he got it, flashing a few very dangerous balls into the box. A big contribution late on from the Ghanaian. Muto – 5 – Was only on for the final 10 minutes but he didn’t make much of an impact after coming on for Almiron. Shelvey – 7 – Gave us that bit of quality on the ball late on, always looking forward and clipping a few dangerous passes into good areas either out wide or into the box.